Is a two-day event, held annually in San Diego during the month of October. 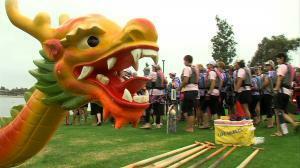 Our dragon boat festival is free for spectators, only participants are required to register and pay race fees. Invite your friends and family to come down and cheer you on and shop in our vendor village! The annual event consists of several divisions for competitive teams that regularly compete in dragon boat races, including Open, Women’s, Mixed, College, and Cancer Surivors divisions. There are teams traveling from out-of-town, out-of-state and internationally to compete at this event. 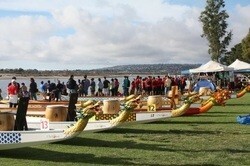 The divisions compete in 20-man and 10-man (small boats) all weekend in the Open, Women’s and Mixed divisions. In contrast, the corporate/novice division is for 16-paddler teams (minimum 6 females) and each team will be provided a steersman and drummer by SDDBT. This division races on Saturday only.